The Supreme Court has rejected the challenge against the immigration rule that does specify that, the spouse must be able to speak the English language before arrival in the UK. Five justices in London have urged to rule that the Pre-entry measure was unreasonable, disproportionate as well as discriminatory. Lord Neuberger, court’s president led the panel has unanimously dismissed an appeal by the two women who are citizens of British. Their husbands cannot speak English as they are foreign nationals, and they wish to join them in the UK. Even though the Supreme Court has rejected the challenge against this rule; the judges seek further submissions from parties as to whether a declaration should be made, for the operation of guidance is incompatible in the present form, with article eight rights, where the compliance with the requirement is almost impracticable. One remedy might be that, the court should declare that its present application of guidance is incompatible with rights of individuals in those circumstances. Lord Neuberger has agreed that the guidance seemed to result in the infringement of article eight in the individual cases but stated the rule itself was not disproportionate. 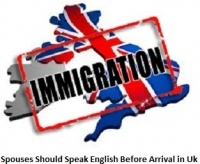 From late 2010, the spouse or civil partner of British citizen or person settled in the UK has been required to pass the English language before moving there. Before amendment to immigration rules, they were only needed to demonstrate such knowledge two years after entering the United Kingdom. During the year 2011, in the month of December, a high court judge in Birmingham had dismissed the judicial review cases brought by three couples. Mr Justice Beatson has ruled stating that, the requirement does not interfere with their right to marriage, and its aim was to protect public services as well as promote integration. This particular visa does entitle the spouse on arrival for a restricted probationary period. After completion of period, the spouse should apply for leave that should be indefinite if the requirement of immigration rules has been satisfied. Where in the applicant for the spouse visa does not satisfy the pre-entry language requirement, the entry clearance officer would automatically consider the issue of whether there may be exceptional circumstances that do warrant the grant of entry clearance outside the immigration rules on grounds of article eight. “Because might result in harsh unjustifiable consequences for the applicant and or their family.